This allows the call from COM to CoUnmarshalInterface on the client side the ability to skip over any unread data and leave the stream in the appropriate position following all the marshaled interface data if the handler cannot be created. As in the case where there is no extra server data in the stream, the client-side COM call to CoUnmarshalInterface will create the identity and handler. 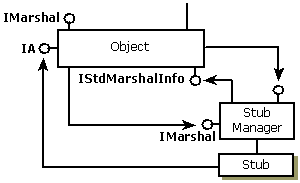 The handler must implement IMarshal and must delegate the IMarshal calls to the aggregated standard marshaler first and then marshal or unmarshal any extra data that the server provided. 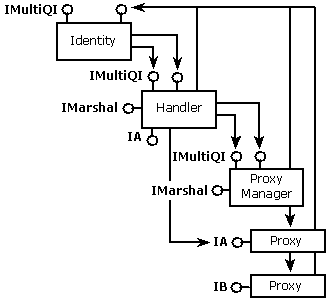 The handler's UnmarshalInterface will be called for every unmarshal, regardless of whether it has unmarshaled the interface before or not. In this case, the server does not call CoGetStdMarshalEx but the handler must. The resulting client-side structure is shown in the following illustration.